Two "malicious" devices were left on railway tracks in a pro-Brexit sabotage attempt, police have said. 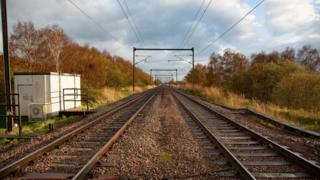 The items were left on lines near Netherfield, Nottinghamshire, and Yaxley, Cambridgeshire, in March. One had a note saying "leave means leave", with another saying it would "bring Britain to a standstill". Assistant Chief Constable Sean O'Callaghan, from British Transport Police (BTP), said the devices were "intended only to delay services". "This was a serious and deliberate attempt by someone to cause significant sabotage and disruption to Britain's rail network," he said. "We're currently keeping an open mind on why someone would put their life at risk to place these items on a live railway, however our early assessment has led us to believe it relates to Britain's exit from the European Union." BBC home affairs correspondent Danny Shaw said one of the devices was spotted by a train driver, with the other believed to have been found during a routine track search. BTP said neither device succeeded in causing a delay to services, and that it was investigating along with the rail industry. No arrests have been made in connection with the incidents.